BANGKOK, March 19, 2019 /PRNewswire/ -- Thai business now features in the influential World's Most Ethical Companies register with the inclusion of DTGO Corporation Limited, marking a milestone for the country's corporate sector.Ethisphere Institute CEO Timothy Erblich congratulates DTGO’s Group CEO, Mrs Thippaporn Ahriyavraromp, on DTGO becoming one of the 2019 World’s Most Ethical Companies. "DTGO was set up to sustain social contribution with business achievement," he said. "After 25 years, our strong growth continues to reflect how good values can yield business success. 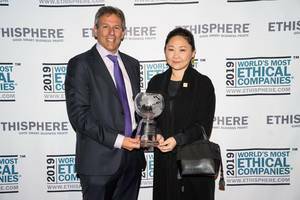 DTGO is delighted to be named among the 2019 World's Most Ethical Companies. We hope that our inclusion sends an inspirational message about Thai businesses. We thank all our stakeholders for supporting our ethical approach." *DTGO's founder and CEO, Mrs. Thippaporn Ahriyavraromp*, represented the group in New York at the World's Most Ethical Companies Honoree Gala in New York on 12 March.